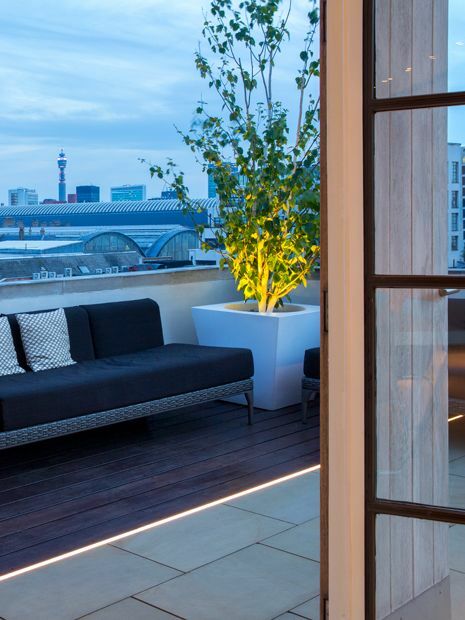 Perched atop Albert Dock in King's Cross, this 45-square-metre penthouse roof terrace is enveloped by the placid water of Regent's Canal. 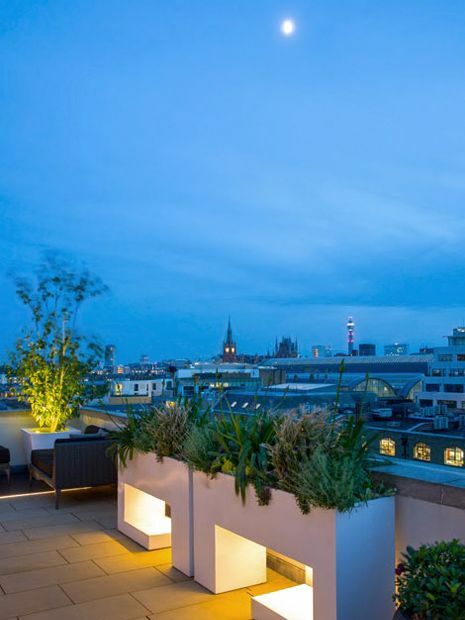 Situated opposite Kings Place concert hall, the rooftop's quaint dockside location and mid-rise aeriality command scenic panoramas across London's skyline at fifth-floor height. The apartment's Art Deco fabric, concert hall's gleaming curvature and our clients' affinity with minimalism have all inspired a decisively architectural roof terrace design – forming the backdrop for a modern warehouse blueprint. 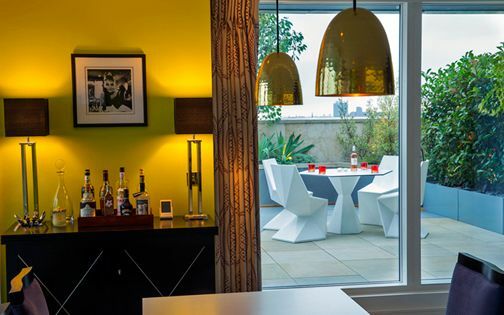 Self-professed minimalists, our clients sought outdoor compatibility with a gleamingly white interior decor. 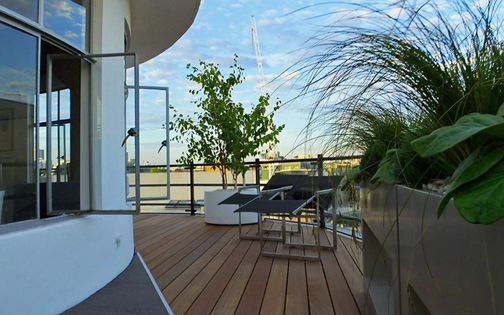 This designedly architectural concord merges minimality of roof terrace garden elements with the barrenness of an unadorned kitchen, nestled across the basin from Kings Place to form a lucid perspective towards modern waterfront architecture. 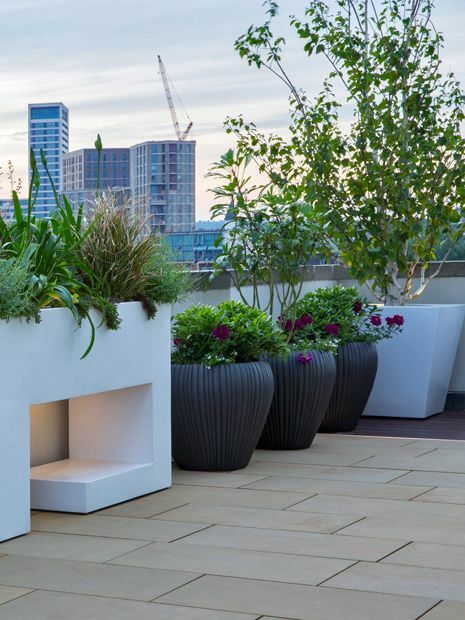 The symmetrical layout, flanked by Himalayan birch trees and curved vases, while focused by geometric planters at its centre, frames the view through a voluminous glazed elevation, where stylish designer rooftop ingredients punctuate an architectural continuum. 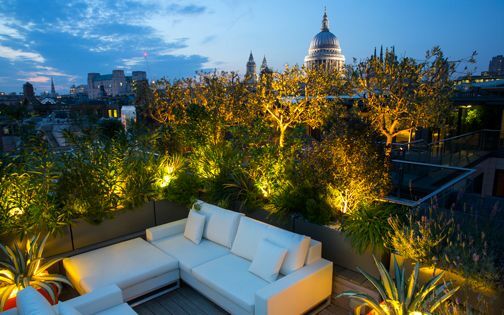 With a further small terrace at the back of the penthouse, adjoining the master bedroom, the rooftops encompass a 360-degree prospect of Central London. The views sprawl across the arched terminal of St Pancras International towards BT Tower in the west, developing into sweeping panoramas of South-east London pinnacled by the Shard. 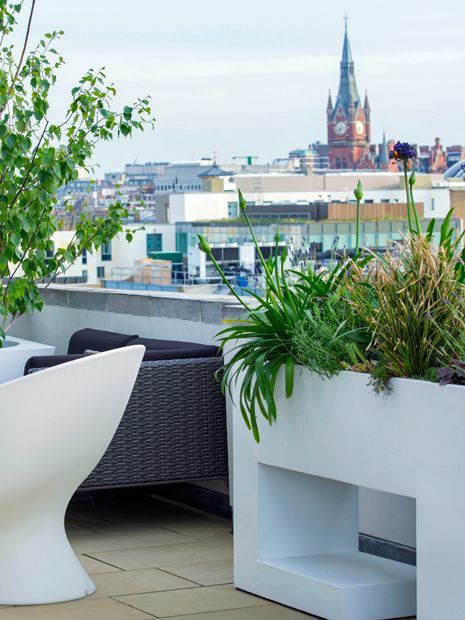 Enfolded by canal-side quaintness and Islington's myriad of green pockets, the main roof terrace forms a lucid interlayer of cleanness amid an Art Deco facade and the architectonic modernity of Kings Place, where eye-level vistas are preserved within a low perimeter. 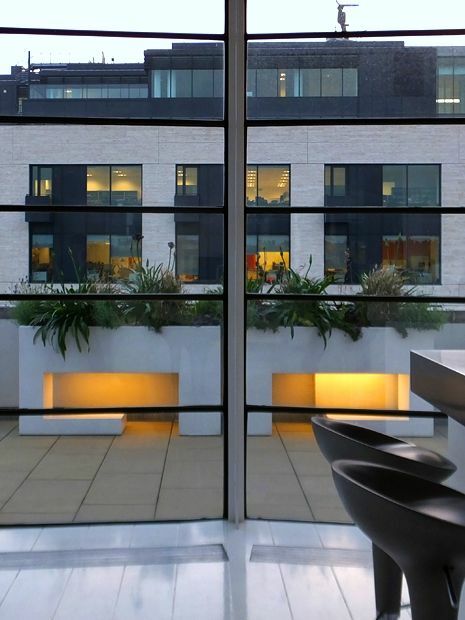 Salient to our design, the interplay between Kings Place's curvature and the living room's bisected icositetragon elevation, furthered by St Pancras' arciform terminal rooflines, inspired an extended geometrical interaction within the terrace's architectural details. 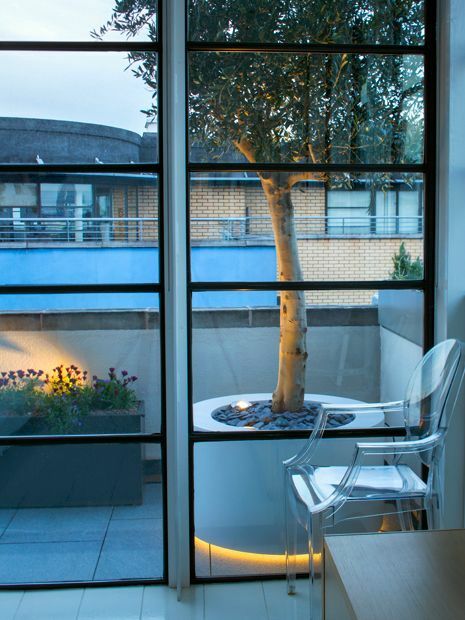 Circular openings inside tapered planters, low forms in curved troughs and sleekness of cylindrical pots are juxtaposed alongside linear shadow gaps and LED strips which emulate the apartment's slender steel frames. Fervently design-led, this sparseness of elements, underpinned by crisp detail, imparts visual clarity perspectively and sustains minimal upkeep. 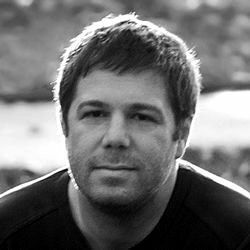 Hailing from England and New Zealand, our novelist and media executive clients enjoy the secluded autonomy of Albert Dock within the Ice Wharf Company. 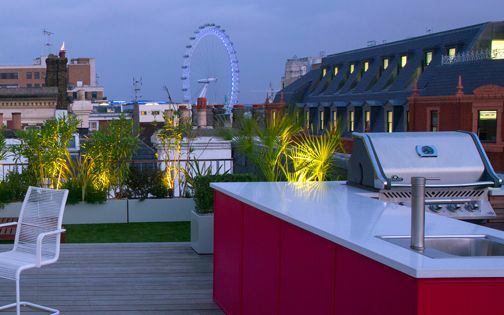 Between glancing at The Guardian's editorial rooms in neighbouring Kings Place to gazing at Battlebridge Moorings below in hazy sunshine, the owners' roof terrace lifestyle embraces a quintessentially citified backdrop with considered unfussiness. 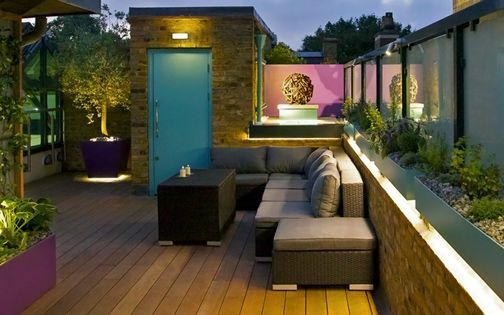 Ardent about all things designable yet reliable, immersed in a rather newly desirable setting comprising remarkable views, these two fascinating gentlemen, alfresco cognoscenti through and through, animate this modern designer roof terrace with their vitality and assured elan. The two roof terraces and their contrasting scales and aspects, the diametric vernacular of architectural facades either side of the canal and our clients' lifestyle, shared between London and Barcelona, all define an inherent duality in both aesthetics and design ethos. 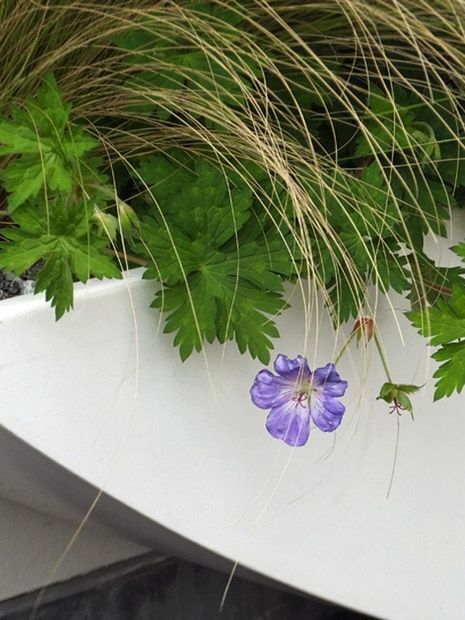 This architectural dichotomy is finely expressed in the clear distinction among geometric forms, surface tonalities and foliar ranges, where each terrace captures the essence of its backdrop and microclimate pertinently. 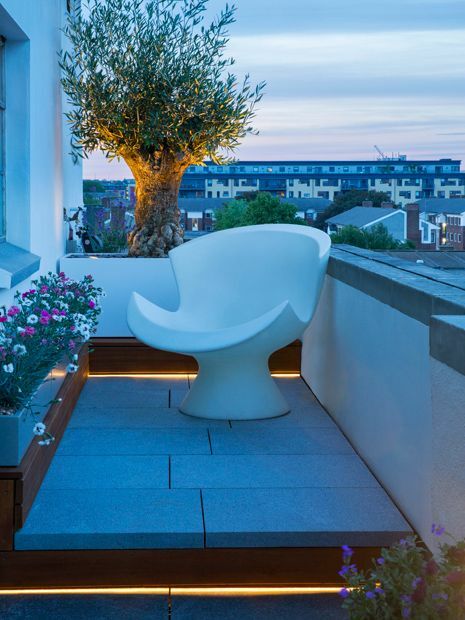 At night, when spatial frameworks relinquish viewability, the lighting scheme resumes connection to the landscape and home in a graphic illustration of sightlines, outlines and ambiences – highlighting the dual role of the modern city roof terrace. 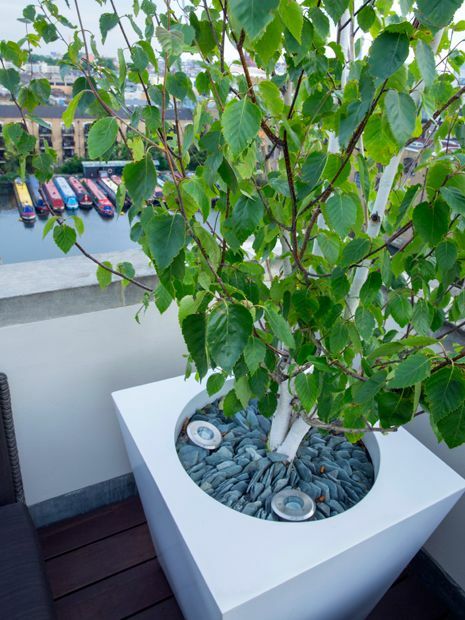 North-west facing, the site endures turbulent winds on both ends, where a low-lying planting scheme accented by two resilient Birch trees withstands the conditions, preserves city views and suits the design's simplicity. 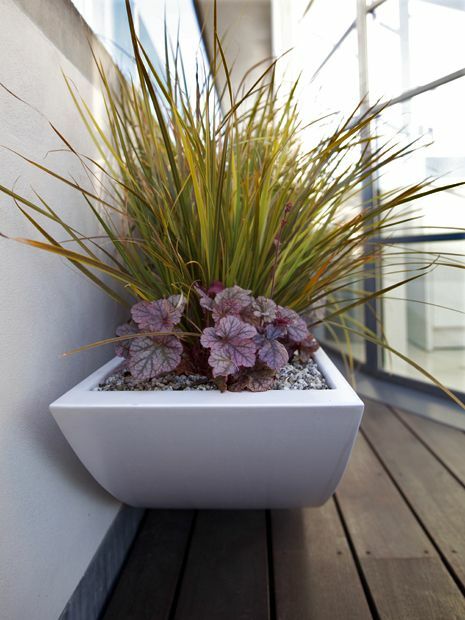 Undulant grasses, cascading herbs and sprawling Lavenders form textural medleys to contrast the rectilinearity of their containers, displaying floras from New Zealand, South Africa and the Mediterranean. 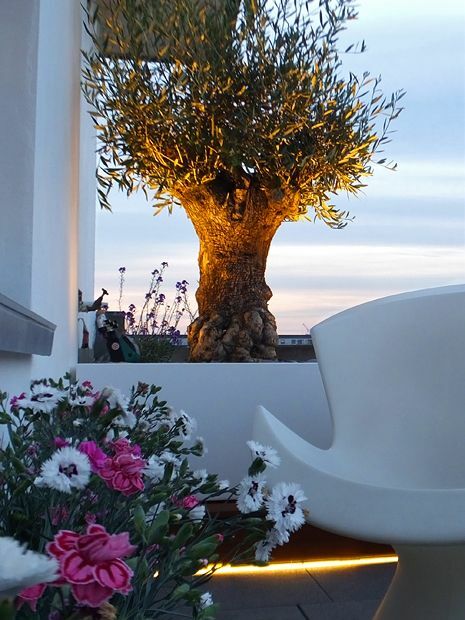 Across the compact 11-square-metre back terrace, a sunny and sheltered prospect under eaves enables cultivation of two Olive trees in distinct forms, Wallflowers and Cape daisies, matched with scented white and red Carnations which fittingly emblematise Spain's national flowers – our clients' second home. Local architects Dixon Jones have sensitively transformed the ambience of a 200-year-old London waterway into a contemporary environment, where the picturesque surroundings of London Canal Museum are observed harmoniously and jointly by both our clients and Guardian editors across the water. The lucidness of Kings Place facade, local hydrodynamic elements, St Pancras' modernisation and the apartment's Art Deco nuances have all impelled the narrative for a designer rooftop canvas – part of a collective reimagined visuality of a Central London milieu at the vanguard of urban regeneration. 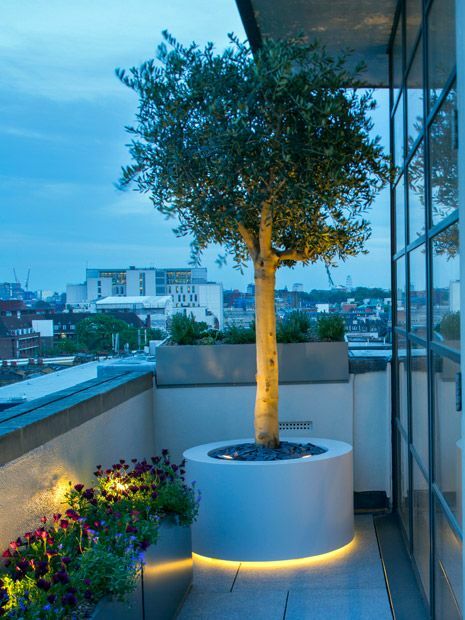 An unfussy terrace design requires an equally understated rooftop lighting scheme, and in this designer rooftop garden terrace, external illumination sleekly consolidates such rationale in amplifying indoor living spaces and reciprocating with city lightscapes. 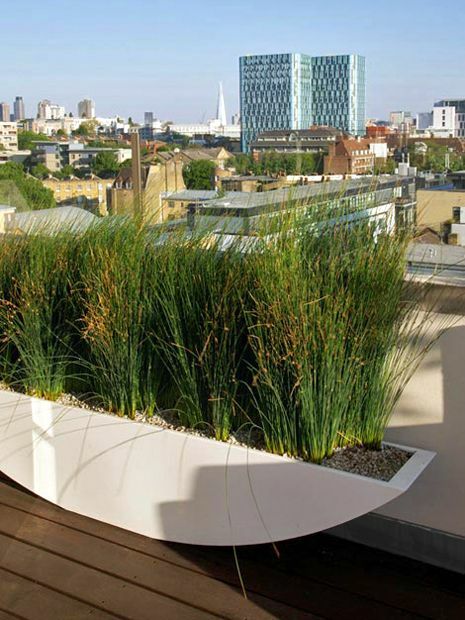 Plants' motion in south-westerly winds is fostered by willing spotlights, forging a visual receptiveness which effectively contrasts the stillness of seating areas amid wavy grassy textures. 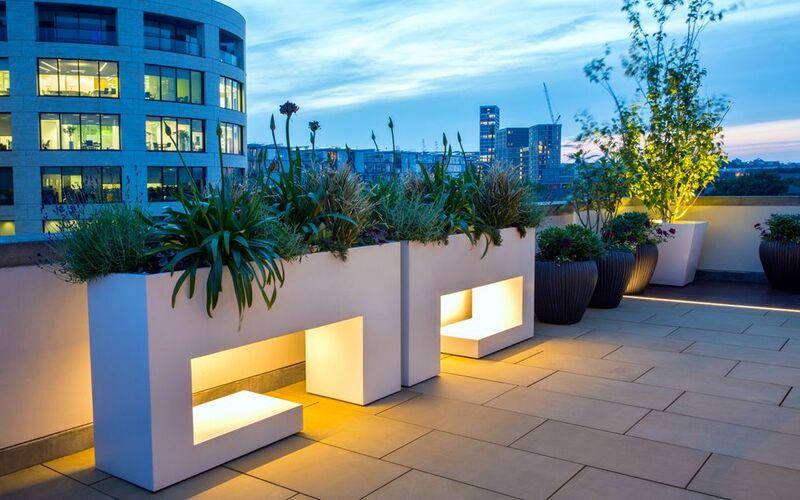 The daytime tranquillity of this canal-side roof terrace is thoroughly completed by LED technology in a variety of methods which orchestrate a well-lit layer of night-time readiness. 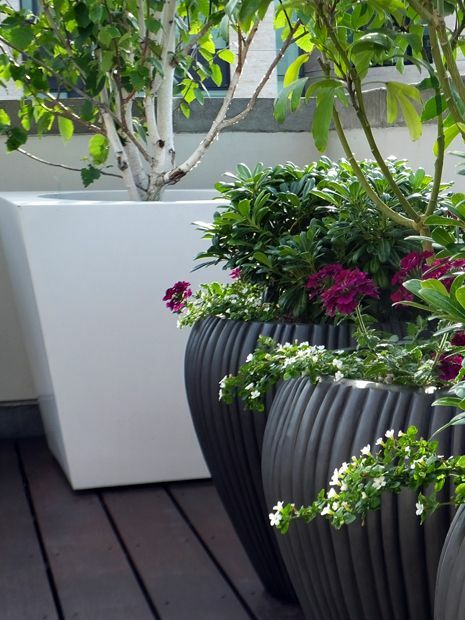 Supersized, cavernous, milky-white and distinctly rectilinear, the roof terrace planters articulate a minimalist approach with only half-dozen containers in three designs and one colour. 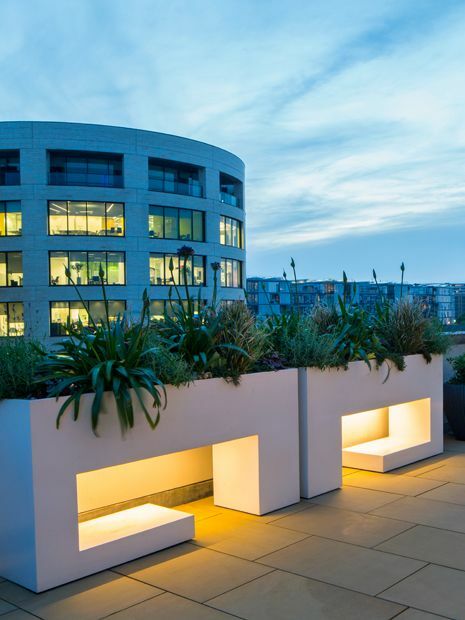 The rooftop's symmetry is intersected architectonically by the gap between a pair of hollowed planters, where foliage is elevated to facilitate airiness, focality and integral lighting. 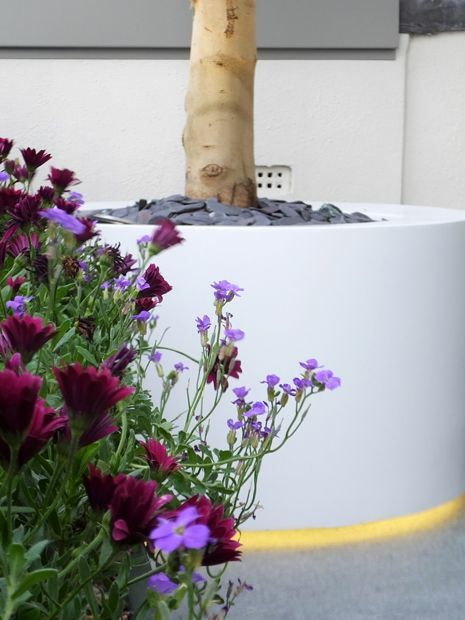 Bordering the sides, 2.2-metre-long vases echo the hydrodynamics of watercourse vessels via low contours, planted with Rushes, grasses and perennials. 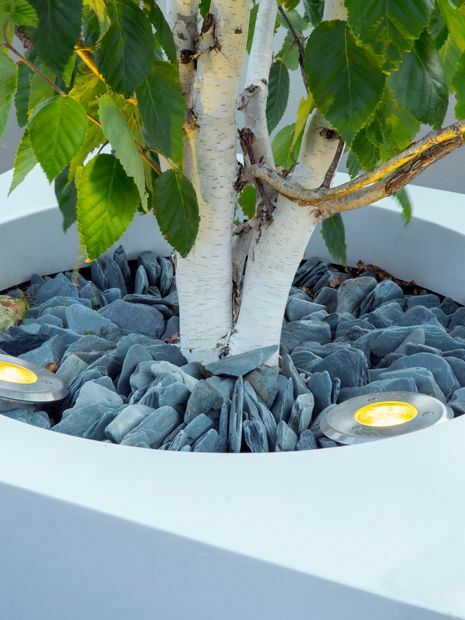 Anchoring the corners, tapered tree planters atop built-in castors feature Birch trees to frame the views and continue the apartment's and concert hall's white palettes. Rectangular buff sandstone pavers extend the interior floor outwards, edged with hardwood decking; the juncture between the two surfaces demarcated by LED strip lights. 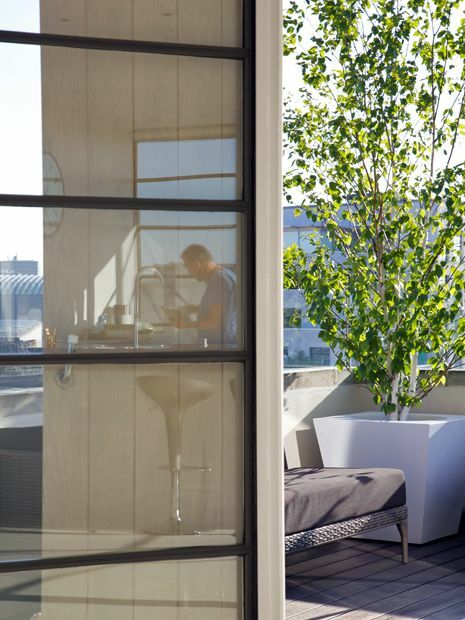 The clean-lined segmentation of these floor materials creates viewing promenades towards city vistas, while carving out space for outdoor rooftop seating. 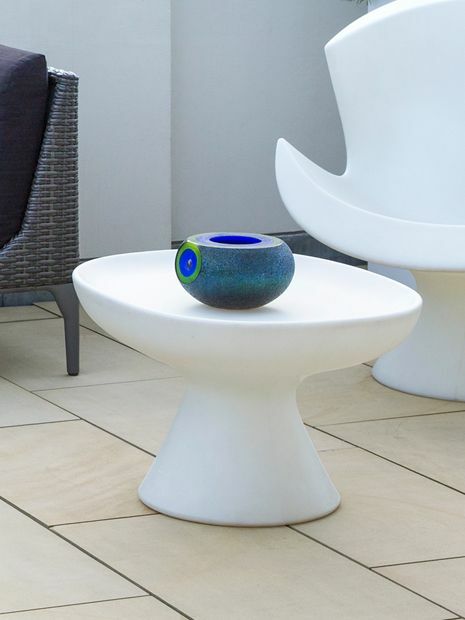 The stone, floating on adjustable pedestals, forms a perfectly levelled floor surface, merging seamlessly with the decking to define minimalist hard landscaping. 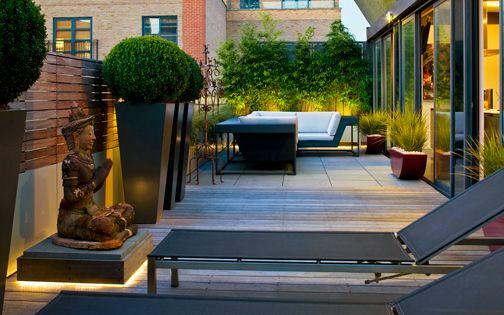 In the small roof terrace, the wood is reiterated as step fascias across a split-level balcony, while the sandstone is superseded by flamed grey granite to harmonise with a predominantly urbanised backdrop. The reinvention of King's Cross as a thoroughly cosmopolitan hub continues to imbue its diffusive zeitgeist and broad designedness rather significantly. 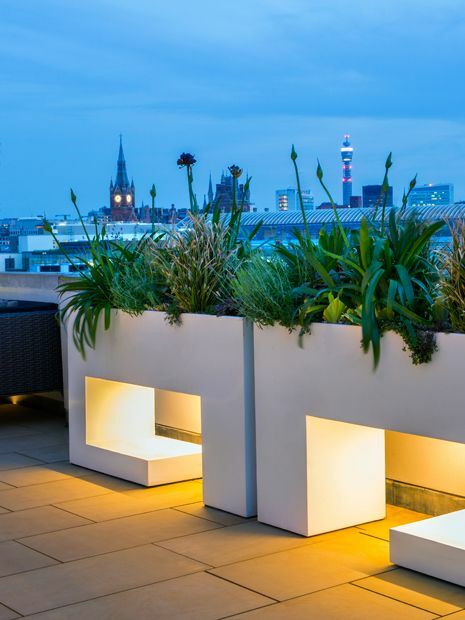 This long-awaited resurgence finds its intimate niches in every brand-new penthouse roof terrace throughout the vicinity. While chiefly envisioned as contrivances of convenience, these designer rooftops filter the nexal energy of a dense urban matrix, bolstering this new-found interdependence in arraying a largeness of landscape both texturally and architecturally. 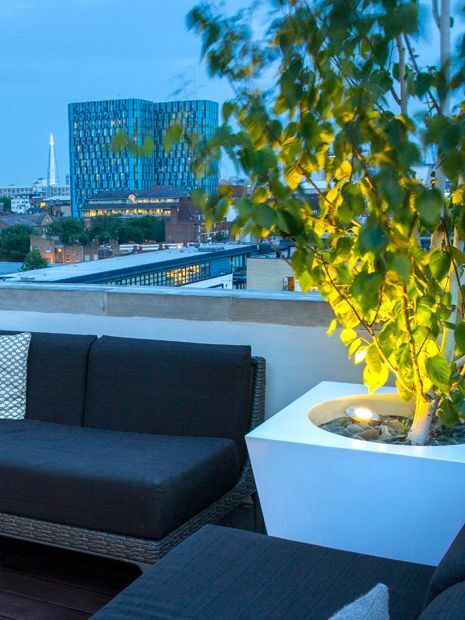 Edgier, trendier, artier and certainly fresher, the roof terrace commanding Albert Dock in Ice Wharf reflects not only a homogeneously detail-oriented, aesthetic dialogue, but also the creative impetus of its Central London locale as a well-crafted designer roof terrace.